As the larval stage of ticks digests its full blood meal to prepare itself for the next stage of life, it then undergoes the molting process, where it sheds its skin. It then becomes the nymph stage of ticks. 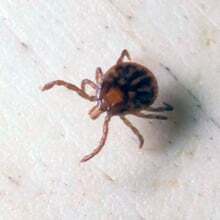 A tick nymph has eight legs, looks very similar to adult ticks but just smaller, about 1.5mm in size. Just like the tick larval stage, this third stage of a tick’s life cycle also needs blood in order to grow and develop for the next and final stage which is the adult stage. As the seed tick molts to become nymph ticks, they again search for the next blood host, only this time, a bit bigger than the larval tick’s host preference. They will feed on mammals, reptiles, or amphibians; they may choose to feed on raccoons, possums, birds and others for several days, filling itself with blood and increasing in size. Tick nymphs are inactive all through the entire winter and early spring, active during the months of the summer season. They will resume their feeding activity after their dormant seasons. After getting its full blood meal, they also drop to the ground from the host to go about digesting their meal and continue its growth and development. They will also then undergo the molting process, shed their skin to become the final stage of adult ticks. Some species of ticks however molt several times before it reaches the final adult stage of their life. The life cycle of the soft tick for instance undergo several nymph stages, increasing its size as it reaches the final molting in becoming an adult tick. This species’ life cycle may take several years due to this several nymph stages. If the larval stage of tick gets infected from feeding a disease reservoir host, the nymph has the capability to transmit that certain disease to the host, like the Lyme disease for instance. However, if the nymph’s larval stage was not infected, they can still get infected by feeding on disease carrier hosts. In most cases, humans become the hosts of infected tick nymphs during their peak spring feeding occurring in late May to July. While the nymphs prefer small animal hosts, humans and pets are also potential host substitutes. This stage of tick life is the cause for almost all of human Lyme disease cases.